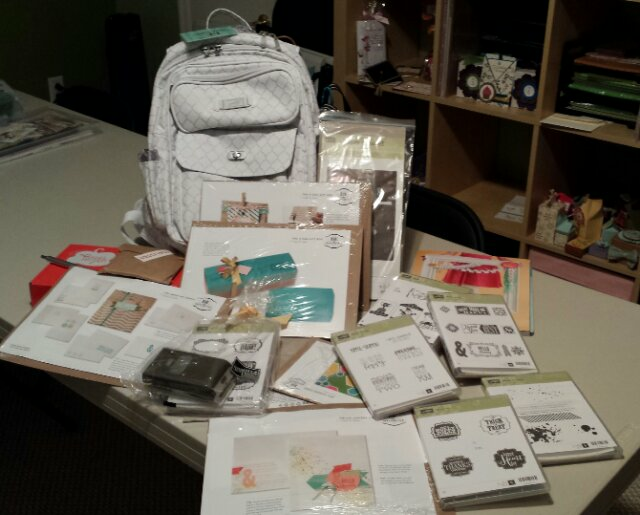 July 25, 2013 Convention / Paper Pumpkin / Stampin'Up! Every year at convention we receive a bag, materials for make & takes, stamp sets and so on. This year Stampin’Up! gave us this gorgeous backpack full on many items. I took home a total of 7 stamp sets, a Paper Pumpkin kit, the new Undefined carving stamp kit 5 make & take kits, a commemorative pin, pen and a few other items! I can’t wait to play with all of them. I returned home on Sunday just before midnight and had to go to work the next day, that being said, I just finished unpacking all the extra clothes I didn’t wear and emptied out my new backpack. Now it’s time to organize my swaps and get ready for Saturday’s class! Flip Cards, Flip Flop Cards, Swing Cards… Whatever You Call Them, Now Made Easy!! Rise & Shine. . . It’s Time for New Digital Downloads! Wow! That is so nice!!! LOVE the backpack and so many goodies! Looks like you had a great time – can’t wait to hear more about it at Saturdays class!